Bearpaw Bay Fire and Mount MoranVisitors at the historic Jackson Lake Lodge usually spend time on the back patio gazing at elk or moose wandering in the wide expansive fields surrounding the lake. The past couple of days, however, the spectacle of fire has overtaken the wildlife as the main attraction. 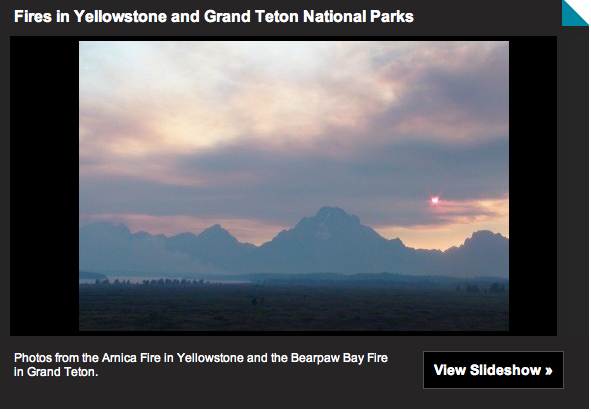 A smoke plume from the Bearpaw Bay Fire, burning across the lodge near Jackson Lake, casts an almost mystical haze over Mount Moran and the surrounding peaks. At night the flames light the far shore in an orange glow. The Bearpaw Bay Fire—likely started from a lightning strike—was reported on September 2 and had grown to over 130 acres by Friday afternoon. Park officials closed backcountry campsites at Bearpaw Bay, Trapper Lake, and the east shore of Leigh Lake as a result. At this time, the park is not actively suppressing the fire, but instead letting it burn to benefit the resource. In Yellowstone National Park, the Arnica Fire surged to life on late Friday afternoon when it grew to 1,200 acres in size and prompted a temporary closure of the Grand Loop Road from West Thumb to Bridge Bay. Although the road reopened on Friday evening, park officials caution that further road closures may be necessary over the weekend as the active burn area increases. Fire teams continue to monitor the fire from the air, ground and the Mt Washburn Fire Lookout and are actively managing it to protect people and property, and the area’s natural resources. The fire can be viewed online from the Mt. Washburn Fire Lookout Webcam. Visitors can access updated road information for Yellowstone National Park by calling 307-344-2117 or by visiting the NPS website. For a photo slideshow of the fires see below.